Kids Club member Cheyenne's unique and adorable story of a private fan club party has been featured on the Kids Corner. Click here to see it! There are many new and wonderful features which have been added to the official site. Many of these can only be seen by VIP members. Why not join? Not only do you get a beautiful welcoming packet, but you also get to view unique and interesting things on the official site! You'll also get a discount on one-of-a-kind merchandise. Click here to join the VIP club. Don't forget to check out Lisa's great story in the Totally Cool Things About Hong Kong section of the Kids Corner. It's full of photos too! Very sad news for friends, family, and fans of Anita Mui...she has died at the age of 40 from cancer. Anita co-starred with Jackie in such memorable films as Rumble in the Bronx and Drunken Master 2. Anita, who was a good friend of Jackie's and Willie's, was also a talented singer. Condolences to her family and loved ones. You can read the touching words of Willie Chan here. "She didn't belong to the entertainment industry. She belonged to all Hong Kong people." "She went peacefully and beautifully. 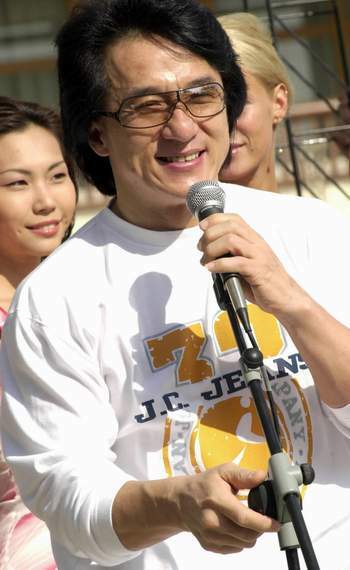 Her own last wish was that her fans and reporters could let her go quietly, not to cry and call out her name," action movie star Jackie Chan, a good friend of Mui's, told reporters after her death. "She really loved to be beautiful," he said somberly. Click here to read another wonderful remembrance of Anita Mui. Do YOU have a pet named after Jackie Chan or one of his movies? If so, send a picture of your pet to the Kids Corner and it will be added to the I Have A Pet Named After Jackie Gallery. So far there's only one pet, but there are surely lots of kids (and adults) who have pets named in honor of Jackie! Click here for all the info! A great new story by Lisa Schwark has been added to the Totally Cool Things About Hong Kong pages. Click here to read Lisa's thoughts on how Hong Kong and home are different.....and the same! Keep looking around the Kids Corner to see other drawings by Holly. If you'd like to see them all in one place, visit Holly's Studio! 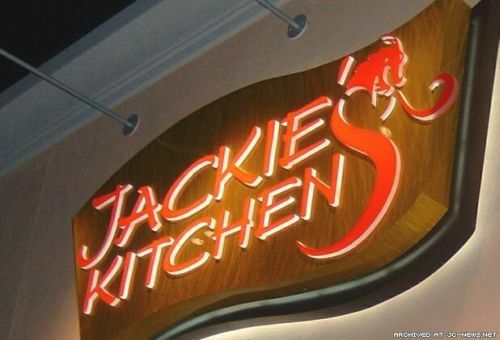 Jackie has just opened his first restaurant in the US - Jackie's Kitchen in Hawaii. The Totally Fun Jackie Stuff section of the Kids Corner has been reorganized. Now, the more recent additions will appear on the first page. Check out this section! There are tons of great things to see and read! Here's hoping that everyone had a nice day yesterday. After you're done playing with your new toys and are looking around for something to do, why not color a Jackie Chan cartoon? Check out the new section in the Kids Corner....it's really a lot of fun! There are printable line drawings that you can color in! 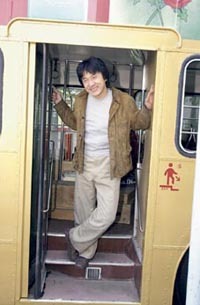 Don't forget to check out the winners of the Jackie Chan Christmas Card Competition for 2003. Congratulations to all the winners and thanks to everyone who sent in a card. You can read the December Little Dragon news online now! Click here. Hey kids....Merry Christmas! Sure hope that all of you got everything you wished for this year. The webmaster has her fingers crossed that she'll find a copy of The Medallion under her tree. What about you? Did you wish for The Medallion? Well, the results are in for the 2003 Jackie Chan Christmas Card Competition. Thanks to everyone who sent in cards. This was the most colorful year yet on the Kids Corner Christmas Cards for Jackie page! All cards that were sent in (even those that came in late) were sent to Hong Kong for Jackie to see. Thanks also to everyone who voted. Check back later to see some new stuff added to the Kids Corner! Have a wonderful day. 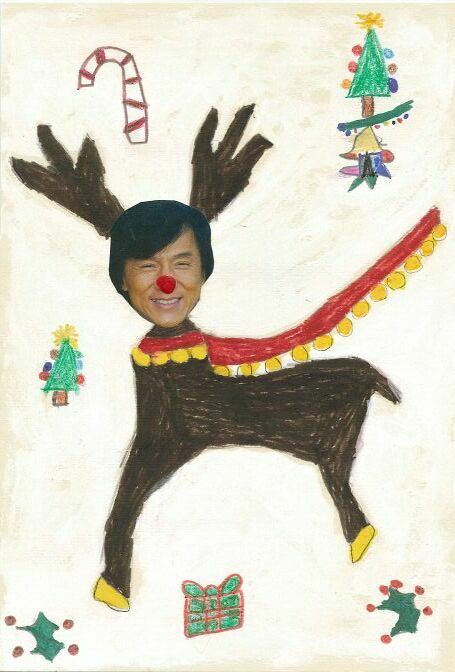 Coming tomorrow: The results of of the Jackie Chan Christmas Card Competition. If you haven't voted yet, there's still time, so just visit the Kids Christmas Card page and cast your vote! Click here to visit Holly's Studio where, if you scroll down, you will find two coloring pages. Just print them out and color them in! This is a new feature on the Kids Corner and if you have ideas for line drawings you'd like to color in, email Kath and let her know. Check out the latest cartoon of Jackie.....can you guess what movie this one's from? As you've surely noticed, the Kids Corner has been featuring many cute drawings by Holly. Click below to see them all (or most of them, anyway) gathered in one spot AND to read the incredible but true story of how the Kids Corner webmaster and the artist from Alaska made contact! The Medallion shows up on DVD today in the US. Run out to get your copy. Rumor has it there are tons of extras....including many deleted scenes! According to this month's American Photo Magazine, Jackie is one of the featured celebrities in Veronique Vial's latest photo book "Hollywood Splash." Vial photographed Jackie for "Men Before Ten AM Too" in 2001. Jackie is described as "splashing wildly about" in his swimming pool for this latest photo shoot with Vial. 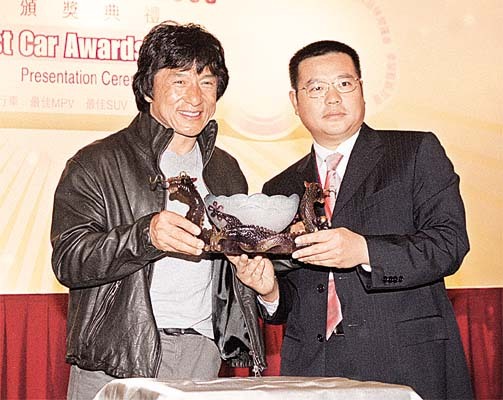 Blackie Ko, friend of Jackie Chan and world famous stunt man who played in several of Jackie's movies including Crime Story and Wheels on Meals, died on December 9th. He was just 50 years old. Here's a photo of Jackie at a memorial service for Blackie. For all Kids Club members who have recently won prizes in any contests, don't fret! Your gifts are on their way. If you live outside of the USA it could take up to 6 weeks to receive your prize, so please be patient. All prizes and gifts have been mailed, so it's just a matter of time. 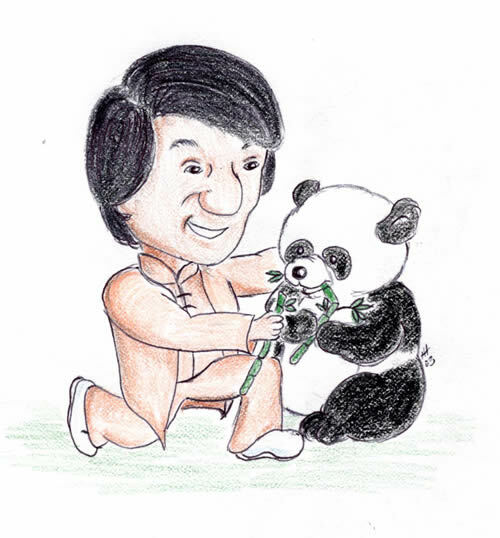 Check out some more of Holly's cartoons on the Jackie Chan Movie page here in the Kids Corner! Many kids have the next two weeks off from school, so this is a perfect opportunity to make a tile for Jackie! Here are a few photos of Jackie holding tiles made by Kids Club member Dan, his brother Cliff, and the Kids Corner webmaster too! The flash obliterates the design on the Buddy Bear - there's a big Yin Yang sign on the bear's belly! Jackie holding two of Kath's tiles. The Kids Corner is not affiliated with MisterArt.com. The supplies have been purchased through this dealer by the webmaster and that is why the link is being given here. Wow! Click here to see some of the deleted scenes from The Medallion. And for those of you who live in the US, don't forget that December 23 is the big day....The Medallion is being released on DVD. If you haven't added it to your Christmas list, there's still time! 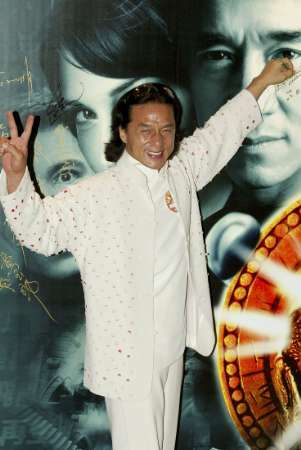 Jackie at the Medallion premiere, Hong Kong. The Kids Corner Cartoonist-in-Residence has been working very hard to provide lots of fun pictures of Jackie. Below is a list of some of the places that Holly's cartoons have popped up on the Kids Corner. Click the links to have a peek! right here on the Latest Jackie News page! A big thank you to Holly for her awesome drawings. Don't forget to vote for your favorite Kids Chirstmas card. Lots of people have voted....have you? Click here to see the cards and cast your email vote. The Kids Corner webmaster is stuck at home with the flu, so you can expect lots of new stuff to show up on the website in the next two weeks. Keep checking back! 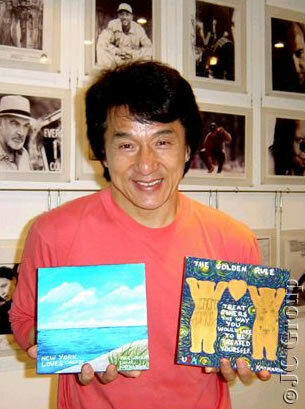 There's a beautiful new drawing of Jackie in the Jackie Chan Art Gallery. Thank you to Rashid from Pakistan! If you would like to scan the drawing and send it by email, that is fine too! It's been a few days since the Latest Jackie News has been updated and that's because the webmaster has been running around like crazy getting things ready for Christmas. Now that she's all caught up you can check the news every day again to read the latest on Jackie! During the next two weeks there will be slight changes made to the Kids Corner and these changes will be posted here on the Latest Jackie News, so keep coming back! 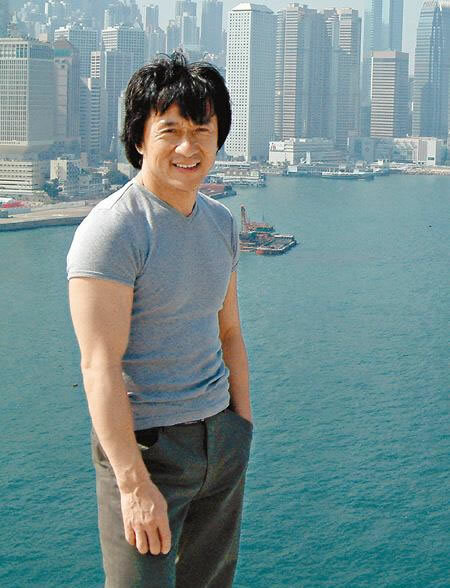 Jackie is still busy in Hong Kong filming New Police Story. 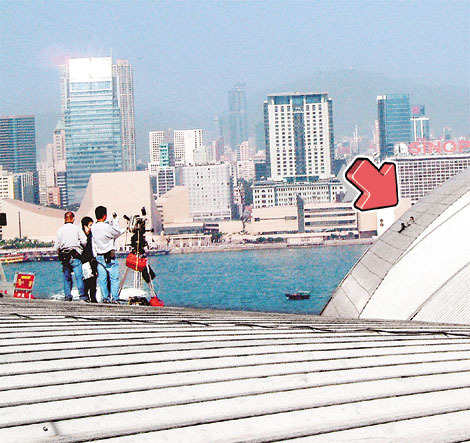 Here's a photo of Jackie filming on top of the Hong Kong Convention Center (that's where The Medallion premiere took place). New Police Story has its own web page now. Click here to have a look at the trailer for the movie. In the Jackie Tile Project section of the website there are many photos of Jackie holding some of the beautiful tiles sent in by fans. Click here to look for yours! If you haven't sent in a tile yet, there's plenty of time. Jackie wants to cover the whole JC Office Building with tiles! Click here to find out information about sending a tile to Jackie. Don't forget to vote on your favorite Christmas Card for Jackie sent in by Jackie's young fans. The contest is pretty close right now so we need your vote. There is one more Christmas Card for the Kids contest that was NOT added in before the voting began!!! The card was scanned and sent to the Kids Corner via email and it wasn't put up in time - BUT IT WAS SENT IN TIME. This card was sent in by Jesse and it deserves to be voted on!! If you've already voted and would like to change your mind and vote for this card, please just send an email with the subject line "Jesse!" 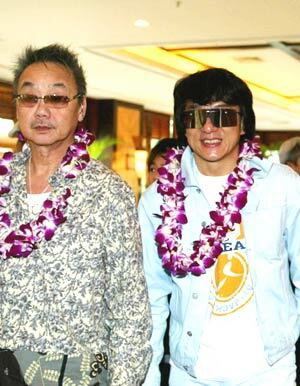 In other news, Jackie is still filming New Police Story. 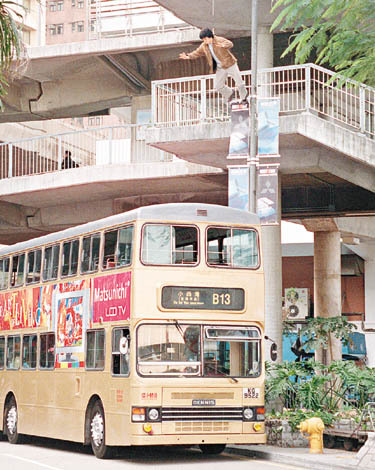 Here's a photo of Jackie jumping onto a bus in Hong Kong. It seems that he hurt himself when he was jumping, but he is okay! Check out these cool postcards made by Stephanie. Click to make them bigger. Hey kids....did you ever wonder what it's like in China at Christmas time? Click to read all about Christmas in China! Voting has begun for the Christmas Card Contest. Please go to the Kids Card page to vote for your favorite! Voting for the Kids Christmas Cards for Jackie Contest has begun. Just click here to go to the Kids page....there is information at the bottom of the page telling you how to vote for your favorite! Thanks to everyone who sent in cards. If your card does not appear on the website it means that it was received at the very last minute and was mailed with the others to Jackie in Hong Kong. Mail is rarely lost, so if you sent it with plenty of time to get here, there should be no problem. Check back here tomorrow for any new cards that might have been added. This weekend you will see more of Holly's drawings appear on the Kids Corner, so keep your eyes open! 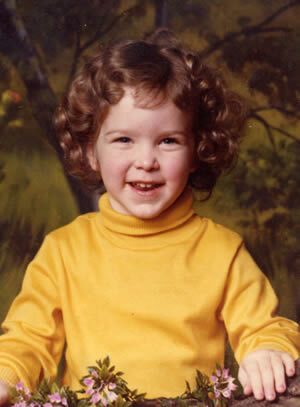 Holly was born in Anchorage, Alaska in the Year of the Dragon. When she was a kid she taught herself how to draw with dinosaurs and dragons. Her hobbies are writing, drawing, and playing the saxophone. She is fluent in Russian and is learning Mandarin Chinese to prepare for a trip to China next fall. Holly works and lives in Anchorage, Alaska. The Kids Corner webmaster is thrilled to have Holly's drawings appearing on the website. They'll appear here as fast as she can make them! There are a bunch of new Christmas Cards for Jackie in the Kids section and in the Big Kids section. Remember, today is the last day for entries in the contest! Judging will begin soon. Click here (the site you'll go to is in Chinese....just click link #4) to see video of Jackie presenting an award at the Miss World contest in Sanya, China. There's a terrific new card in the kids Christmas Cards for Jackie section. Jackie has arrived in Sanya, China to participate in the Miss World Contest. Jackie has been chosen as one of the judges. It's a tough job, but somebody has to do it!! Jackie sure looks like he's having fun! Remember, there are some FANTASTIC prizes!!!! Wow! The Scammell family (and Christian) were very busy making cards for Jackie! Check out all the cards that they sent (check both the Kids and the Big Kids card sections). It's hard to tell by the scans of their cards, but they were full of glitter and cotton balls and foil paper. Great job! 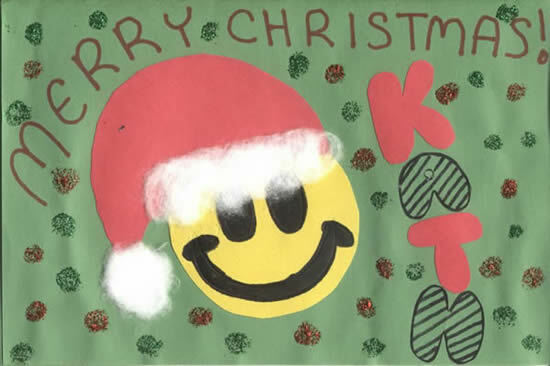 Below is a beautiful Christmas card that they sent to the webmaster here at the Kids Corner. Thanks so much! Kids, this is your last chance to get your Christmas card for Jackie mailed in. The contest ends on December 10 and all the cards are going to be sent to Hong Kong. There's still time to make and mail a card! Check out the beautiful card made by "big kid" Leoni from South Africa. Jackie will surely love the dragon on this card. Click the card below to go to the Big Kids section and see all the cards AND to see this one enlarged! Jackie will be in Sanya, China this weekend to judge the Miss World Contest. The competition will be broadcast to an estimated 2 billion people in the world! Click here to read more in Jackie News section. 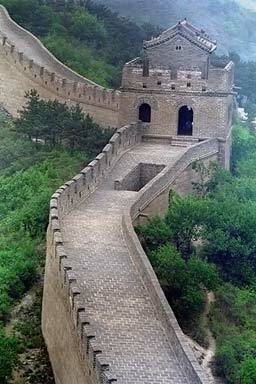 Also making the news is Around the World in 80 Days since it will be the first movie to be filmed at the Great Wall of China! Read about it in Jackie News! Jackie is SO excited about all the tiles he's received that he now wants to cover his entire JC Group office building with them. So send yours in! So far there is no cut-off date.....maybe you could work on your tile during the Christmas holiday! Click here for information on sending in a tile. 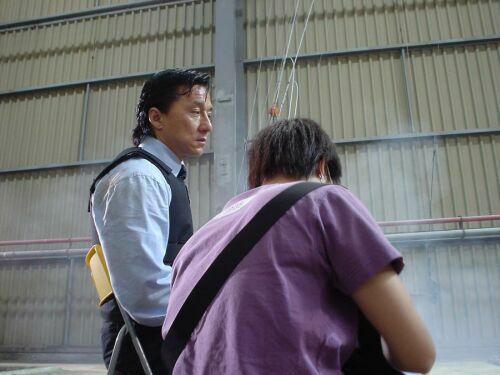 Not a lot of Jackie news out there, but there are some awesome photos from the set of New Police Story circulating on the Internet. Here are a few! (Photos: http://kamunion.wo.to/) Thanks to Seung Ho for the link. Jackie shooting a scene from the movie. 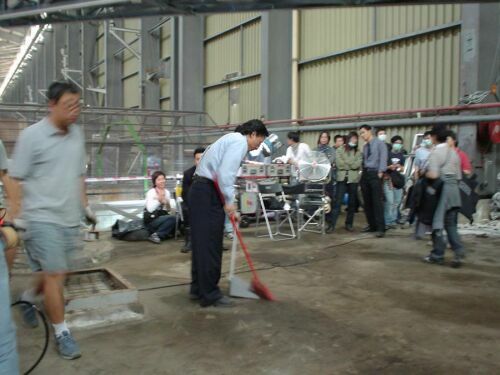 Jackie sweeping on the set (as Jackie is known to do). Jackie's diary has been updated (for VIP members). If you're not a VIP member yet, please think about joining up. There are many benefits to joining and you'll get a terrific new members packet from Hong Kong!